Hi, I’m Scott Mansell, founder of Driver 61 and a very lucky chap. In the 25 years I’ve been involved in motorsport, I’ve been fortunate enough to drive some of the world’s most fantastic cars—from Ferraris to F1s—on the world’s most exciting circuits, surrounded by many amazing team members. And I’ve learnt a few things during the thousands of hours I’ve spent in the driver’s seat. My goal for this site is to transfer this knowledge to as many trackday and racing drivers as possible, while creating a community of like-minded motorsport enthusiasts. My love for motorsport started with my father, the original Driver 61. I grew up hanging around the UK circuits, watching him (Kevin, not Nigel) throw that Lotus Cortina around with such finesse and style, always bringing the spectators and commentators joy. He did this while running his team, Mansell Motorsport, where he engineered and developed customers’ cars. 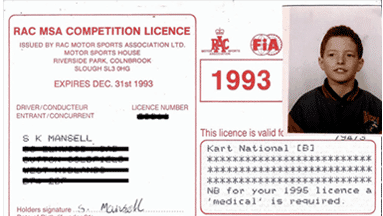 I was four when I got my first kart, and I began racing at the age of eight. I loved every second, without realising that my father was teaching me not only how to drive, race and be mentally prepared but also how to engineer the machinery to reach its potential. This is where the Driver 61 name and logo originates. My father passed all his knowledge to me, and now it’s my turn to do the same (with the help of the Internet) for a much wider audience. After my karting days, I competed in lower-level single-seaters for a couple of seasons before taking the unusual route of competing in a seven-year-old F1 car in the European BOSS GP Series, at the ripe old age of 18 years and 4 days. At that time, Formula Renault and BMW were the accepted paths for young drivers, and putting anyone under the age of 20 in an F1 car was not at all common. I ended up winning the European championship that season, and I broke five outright lap records along the way. This raised a few eyebrows, and I was nominated for the McLaren Autosport Young Driver Award. I also tested with Christian Horner and his Arden International / Red Bull GP2 team and met with a couple of interested F1 teams. As is all too common in motorsport, I struggled with budgetary constraints, and after a couple of years in and out of Indy Lights and European F3000, I decided to focus on developing race cars and coaching drivers. During my car development and coaching career, I’ve been fortunate enough to test or race 15 different F1 cars for private owners—bookended by 1982 and 2012 Lotuses—as well as hundreds of other racers ranging from Caterhams to Mclarens. I’ve coached in 22 countries around the world, helping hundreds of racing and track-day drivers become faster, safer and more consistent on the circuit. I hope we will be of value to you as we add more content to the site. If you have any questions or comments, please contact us.